The expansion of suburbs and the resulting landscape changes have created ideal habitat for deer. Mild winters and lack of natural predators have also contributed to the growth in the suburban deer population. 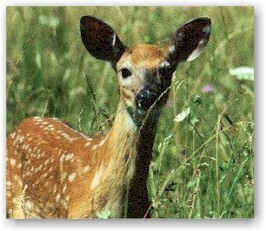 Consequently, the chance for conflicts with humans increases as the number of deer increases. Fortunately, most deer damage can be successfully abated with simple, humane techniques. Fencing landscape plants and crops is the most effective way to eliminate deer browsing. Fences should be at least six feet high and openings should be no more than four inches wide. Fencing should be combined with chemical repellents and other deterrents for the first year. Individual trees, bushes and groundcover can be protected with stiff plastic netting. Netting is most effective when used for short periods during critical times; it reduces rather than eliminates browsing. Visual deterrents such as strobe lights, timed lighting systems or Mylar tape strung between trees may startle deer. Loud distress calls of other animals, commercial ultrasonic devices, motion-activated sprinklers, tin cans rattles and other noise deterrents can help scare deer away from your yard. However, deer may become habituated to these hazing techniques. To maintain their effectiveness, combine them with other approaches such as fencing and chemical repellents. A variety of commercial and home-made repellents have proven successful in deterring deer; Consumer Reports rates Rockland's Hinder® to be a "Best Buy." Repellents work either by making plants unpalatable or by giving off an offensive odor. They are most effective if used when signs of deer first appear and not after significant damage has occurred. 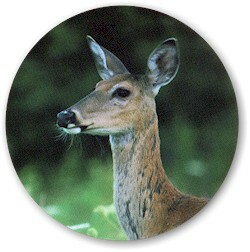 Deer repellents are available at nurseries and hardware stores. Note: Repellents, Mylar tape and the Scarecrow® motion-activated sprinkler are available through Wally's Workbench at the shelter or online. Blend 4 eggs, 2 ounces red pepper sauce and 2 ounces chopped garlic with enough water to make 1 quart. Strain and apply liquid with a garden sprayer. Makes enough for one application on 16 bushes. The selection and placement of plants has a significant impact on the extent of damage. Some plants attract deer, while others may repel them. Repellent plants - Catnip, Chives, Garlic, Honeybush, Lavender, Onion, Sage, Spearmint, Thyme and Yarrow. Property borders and entryways can be made less attractive by lining them with resistant and repellent plants. Also, grass and underbrush should be kept trimmed and ripe fruits removed promptly. 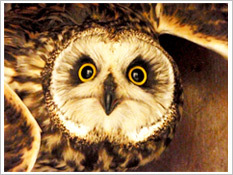 Always watch for wildlife, especially at dawn, dusk and the first few hours of darkness. Be extra cautious in late spring and mid-to late fall. Glance continuously from the road to the roadside, looking for movement where roads are bordered by fields or natural habitat. Heed warning signs and reduce speed in places deer are most likely to cross. If you see one deer cross, expect others. If a deer "freezes" in your headlights, try turning your lights off and then back on. Feeding by humans only serves to encourage deer to remain in an area and it reduces their fear of people. Moreover, under certain conditions, artificial winter feeding can boost the birth rates the following spring. More information about humanely co-existing with our wild neighbors can be obtained by browsing our other expert articles. Modified and reprinted with permission of the Animal Protection Institute.